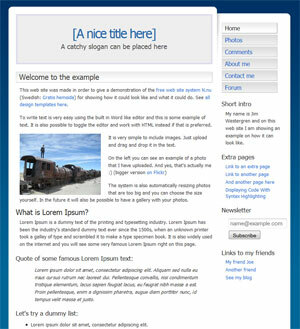 The quickly growing website host N.nu is now featuring three of the templates from andreasviklund.com. N.nu is a free online website builder which offers the ability to build high-quality sites for free, with a set of useful premium services available. If you are looking for an easy way to build a website, it is well worth a try. I will post a review of N.nu before the end of this week, with a short tutorial on how to set up and organize a N.nu site using one of the andreasviklund.com templates. At the moment, the templates that have been made available are andreas03, andreas08 and andreas09. The creator of N.nu, Swedish web developer and SEO professional Jim Westergren, has joined the andreasviklund.com forum. If you have specific requests for templates that you want to use with N.nu, feel free to post your requests in this forum thread. I am looking forward to be of service to those of you who choose N.nu as their website solution. And I will convert more of Andreas templates to N.nu in the near future. I am certain that this is a win for everyone involved. Snygga mallar och så har de bra balans mellan design, funktion och användbarhet.